Trump’s Bureaucratic Reorganization-Labor/Education 1st, then? Update: A friend of mine who worked for the Bureau of Land Management relayed the following: “Gifford Ginchot, the first USFS director, and Harold Ickes, Sec Interior, hated each other so when USFS was created and Pinchot was chosen to lead it, he got Congress/President to place it in USDA.” How is that for logic! Federal programs have three things in common, they never expire, they never get smaller, and no one ever holds them accountable. Also, the more agencies that perform the same task the less likely the American public will ever figure out the real cost of these programs! Probably one of the best examples is “welfare” that was spawned by President Johnson’s “Great Society”. Do you know how many Federal agencies have their own separate welfare programs that were spun off of the Great Society and the New Deal? There are 7 departments, the IRS, Dept. of Agriculture, Dept. of Education, Department of Labor, Health and Human Services, Housing and Urban Development, and the Federal Communications Commission. These agencies administrate at least 15 different “welfare” programs with doubtful levels of coordination of benefits! The IRS, you probably didn’t think of this one, has two “negative” tax programs including the child tax credit and EITC; the Dept. of Agriculture is responsible for Food Stamps (SNAP), Child Nutrition, and WIC (as well as being the largest printing entity in the world! ); Health and Human Services is responsible for AFDC, Medicare, Obamacare subsidies, TANF, Head Start, Child Care, and LIHEAP; HUD is responsible for housing assistance; the Dept. of Education is responsible for Pell Grants, the Dept. of Labor is responsible for job training; and the FCC is responsible for that wonderful program, Obamaphone, AKA Lifeline. This level of overlap is “normal” and PLANNED in the federal bureaucracy where multiple agencies are charged with providing similar benefits and services to the same US family! Welfare as a function is ripe for consolidation in an attempt to reduce redundant bureaucracy, streamline benefits, and reduce operating costs. This program is ripe for President Trump the businessman! No way would he condone this level of redundancy in his own businesses. Trump’s First Targets-Consolidate the Departments of Labor and Education. President Trump has already begun his reorganization of the Federal Government and the streamlining of the bureaucracy. He has charged Secretaries DeVos and Acosta to develop a plan to merge these two cabinet level departments! Why? Simple, these two departments and functions need have a single goal of educating our youth so they can enter and contribute to our economy! Many say the Department of Education has a role of reshaping our social structure and teaching our young people the “new” mores such as homosexuality, transgenderism etc., and to protect our public school system. Really? I thought our schools were to educate our children and leave the teaching of social values to their parents! In 2015, US students ranked 38th out of 71 nations on the PISA assessment! (Programme for International Student Assessment (PISA). While the DOE is responsible for educating our youth, the DOL also spends billions on training and employment programs for adults. By combining these two department, we can tightly coordinate education whether it be for K-12, adult education, or vocational re-training. The better we educate K-12, the less we will require adult training and re-training! By combining these two agencies, we can have a single department to oversee all forms of education and labor development and education. The DOL has a large statistical department to measure the job market. This department can then also measure the effectiveness of our K-12 education and how effective it is in providing the labor force that best serves the needs of our economy. Well, the President has already signaled he is looking to reform welfare. This is critical to fill job openings that now are larger than those who are unemployed. Will the President move all of the welfare assistance programs noted above under a single agency and consolidate these programs into adult, child and family benefits and services? He may! This would streamline these services, ensure that a family’s services are consolidated and controlled by a single agency, and cut way back on fraud and abuse. If he does, he should also move SSI’s control and funding of “disability” benefits into this new agency. Health and Human Services seems to be the most logical agency to assume this role. One of the nuttiest duplicate and overlapping functions is between the Food and Drug Administration and the Department of Agriculture. Both have responsibility to oversee various levels of food safety among other activities. One agency should oversee food safety, period. Today, some food manufacturers have to have a USDA and a FDA inspector on site depending on which products they produce! It is not only a waste but they have conflicting rules which makes the workplace chaotic. I would suggest that the FDA assume all food safety roles. Do you know who controls federal lands, water, parks, fishing and hunting control? Well, how about the Department of Interior and the United States Dept. of Agriculture, (USDA). Why would the forestry service be under the USDA and the Bureau of Land Management be under the Dept. of Interior? How about giving the Forestry Service to the Dept. of Interior and have the USDA concentrate on AGRICULTURE! I can go on and on but you get the point. There are way too many duplicate agencies across multiple departments and cabinet secretaries. Jurisdictional battles are the norm and inconsistent management practices and fraud and abuse are the norm! I hope the President wins back control over the House and increases his control of the Senate by at least 60 seats. If he does, he can do a lot more than tinker around the edges of reorganization the Federal bureaucracy. Many changes will require Congressional approval and we can only hope that we elect those who have the spine and the work ethic to do what is necessary to revamp the SWAMP! 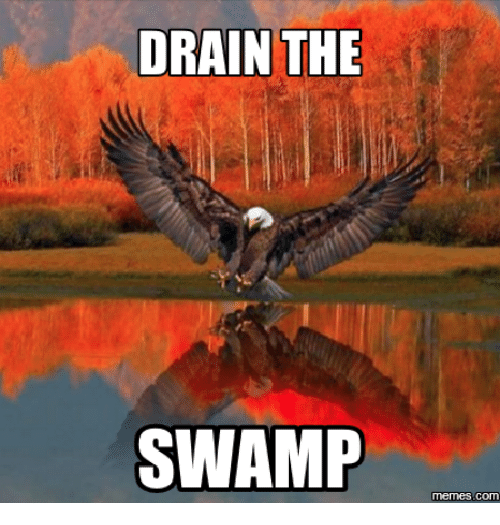 If Trump has true partners in Congress, WE CAN TRULY DRAIN THE SWAMP!